Here, one of the super-talented winners of F&W’s Digital Food Awards, Matt Armendariz of Matt Bites, ponders our national obsession with kale and shares some of the most unusual ways to sneak the superfood into everyday foods. Ancient grains. Fermentation. Kimchi anything. While some ingredients and techniques drift in and out of the culinary zeitgeist, one particular superfood shows no signs of returning to the back of the vegetable crisper drawer. Kale is here to stay; it’s served in just about every kind of restaurant imaginable—from farm-to-table spots to taco trucks—and at-home cooks can look to blogs and books like 50 Shades of Kale for daily inspiration. Now that it’s been massaged, chopped, juiced, baked and tempura’d, common recipe hacks like swapping kale for collards and mustard greens are beginning to feel amateurish. That’s why the next wave of kale experimentation is heading into more unusual territory. Here’s what we’ve found on the outer edges of the kale universe. Kale for dessert. Kale chocolate chip cookies (from 50 Shades of Kale), kale ice cream, kale chocolate cake and kale doughnuts. Kale can’t help but lend a pallid green tinge or its tiny flecks to baked goods, but the earthy, bitter flavor isn’t too pronounced and can be quite palatable. And if eggplant can coexist with chocolate peacefully and historically in southern Italy’s melanzane al cioccolato (fried eggplant with chocolate sauce), why can’t kale? Plus the kale-stuffed-dessert crowd may have one big benefit over everyone else: It justifies the consumption of a plateful of cookies. Kale cocktails. Juiced kale is the king of juice bars and the primary way to sneak the superfood into unusual recipes, so it shouldn’t be surprising when juice heads reach for it when making cocktails. 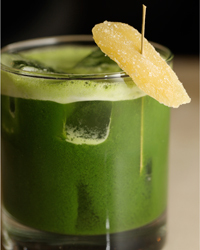 Kale and tequila, anyone? Kalechiladas. While the kale-filled pierogi isn’t new, chefs can be seen tucking kale into just about anything these days: ravioli, empanadas, roulade, manicotti, enchiladas, etc. If you roll it, they will come. Kale balls. While hardly absurd, kale is easily disguised in ethnic recipes. Add finely chopped kale to meatballs or use it to replace spinach in saag paneer. It also works as a substitute for taro leaves in Hawaiian and Indian cooking. Kale cream. Apparently kale makes a great facial mask and astringent as well as a body scrub—for those rare moments when you’ve reached your maximum kale intake and just need to spread it all over yourself.